Description: CSA #12 on adversity cover fashioned from bank check document postmarked SALISBURY, N.C., JUL 13 sent to Eagle Mills, NC. Description: CSA #12 on cover postmarked green LYNCHBURG, Va., OCT 4 sent to Atlanta, Georgia. Description: CSA #11 on cover postmarked MACON, GA., sent to Spring Place, Ga. Description: US #65 on cover postmarked NEW BERNE, N.C., MAY 21 with matching fancy cancel sent to Northampton, Mass. Description: US Scott 56X2 franks interstate Confederate domestic letter. Description: 1861 3c rose (#65) tied by Montpelier VT cds on cover to Williston, Vermont. Description: US #65 on cover postmarked EAST BLOOMFIELD, N.Y., JAN 8 with matching fancy cancel sent to St. Johns, Mich. Description: Stampless folded 2 page letter postmarked red PEND, S.C., MAR 18 with manuscript "25" due rate sent to East Medway, Massachusetts. Description: US Scott 15L5 franks an inner city folded letter. The contents mention Blood's post. 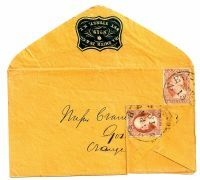 Description: CSA stampless cover postmarked DALTON, Ga., NOV 4 with matching DUE 10 in circle sent to Rock Spring, Ga. Description: CSA #6 pair on cover postmarked MILLEDGEVILLE, Ga., sent to Thomaston, Ga.